Researchers from the Technical University of Munich (TUM) and Johannes Gutenberg University Mainz (JGU) have opened a new chapter in their long-standing collaboration concerning the generation of ultracold neutrons (UCN). 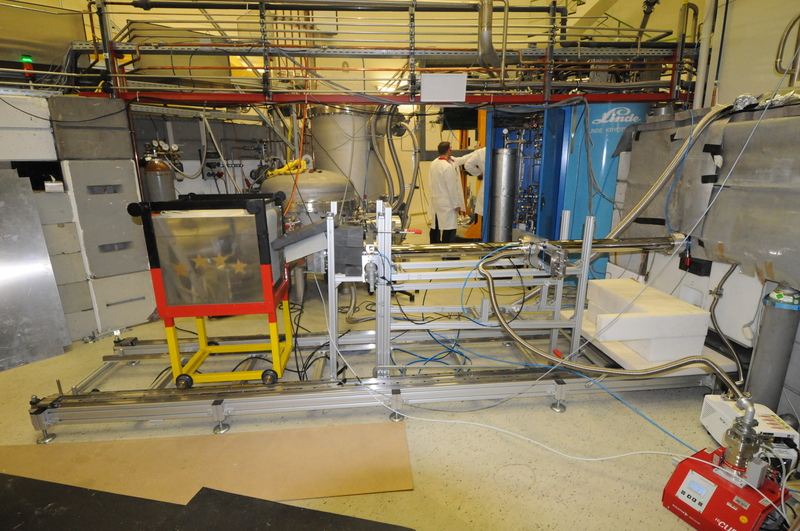 A second source of ultracold neutrons has recently been installed at the TRIGA research reactor in Mainz. In initial tests, this source has been delivering excellent results. Neutrons are the neutral particles that form part of the atomic nucleus. In unbound form, as so-called free neutrons, they are unstable and decay rapidly. Experiments with ultracold neutrons are of special relevance for fundamental research in physics, particularly in the fields of cosmology and particle physics. For this purpose, free neutrons are cooled to very low temperatures, slowing down their movement to a level where they can be stored in special containers. The first source of ultracold neutrons was established in Mainz in 2006 in a joint project with TUM. Based on the experience gained with this system, an optimized source was installed on beam tube D of the TRIGA reactor in Mainz within the context of the Cluster of Excellence "Precision Physics, Fundamental Interactions and Structure of Matter" (PRISMA). This source is also made available to external users and is utilized for such tasks as measuring the half-life of a free neutron. This source is mainly employed in pulse mode operation. 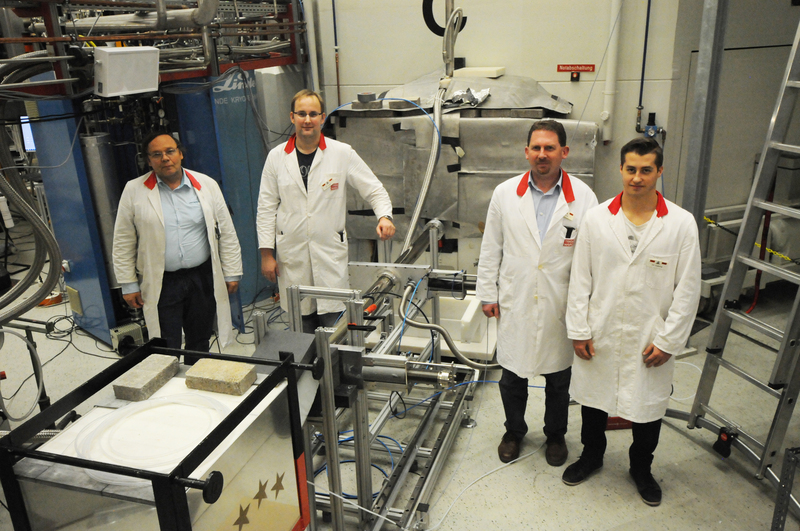 Last winter, scientists from Munich and Mainz installed a second neutron source on beam tube C. The components were built at TUM, then transported to Mainz, and installed within seven days. "We have learnt quite a lot in the last few years and have reconstructed the ion source on beam tube C to improve it," said Dr. Andreas Frei of the Research Neutron Source Heinz Maier-Leibnitz (FRM II) at TUM, who has been participating in the project since the early days in 2006. The Munich scientists are using the results of the tests and experience gained with the system in Mainz to design a high-efficiency source to be installed at the FRM II in Garching operating at 20 megawatt reactor power. "We are testing individual components here and will use the data collected to develop materials for our future source facility," explained Professor Stephan Paul of TUM. The planned facility will be used to investigate fundamental aspects of the properties of the neutron. "Our new UCN source is supplying outstanding results, and along with our colleagues from TUM we are very pleased that the installation was completed in such a short time," added Professor Tobias Reich of Johannes Gutenberg University Mainz. "We expect in future to obtain new insights into ways in which we can further upgrade such a source of ultracold neutrons." Access to the device on beam tube C will also be provided to other research teams in coming years. The source generates ultracold as well as cold neutrons, which can be used, for example, for structural investigations. The cooperation agreement between JGU and the Research Neutron Source Heinz Maier-Leibnitz (FRM II) at TUM initially runs for three years but a further extension is planned. The project is being funded through the Priority Program "Precision Experiments in Particle and Astrophysics with Cold and Ultracold Neutrons" (SPP 1491) of the German Research Foundation (DFG).